Pokédex Entry "By spreading the broad petals of its flower and catching the sun's rays, it fills its body with power." History Born in Kanto like most of his kind, Coltrane lived the first few years of his life in the care of his parents and two older siblings. They lived in a large clan consisting of nearly thirty members on a vast plain the eastern part of the region. As a young Bulbasaur, Coltrane was active and curious, eager to explore his home and as such he often found himself getting lost in the surrounding forest. One of these times led him into a lot of trouble. A group of Weavile ambushed him in the forest and demanded that he helped them to steal something very valuable from a nearby human settlement, promising to reward him with a lot of berries if they succeeded. Knowing that talking to strangers was never a good idea, Coltrane refused and tried to flee. However, the leader of the Weavile chased him down and ordered his underlings to hold the young Bulbasaur down. Coltrane struggled and screamed for help as the bandit chief began to hack away at him with his claws. Before leaving him bleeding and badly wounded, they managed to rake out his right eye. Coltrane can still clearly remember when his vision was drowned out by red before turning black. When he woke up, he was lying on a cushion wrapped in bandages within a small human settlement. Panicking, he jumped to his feet and ran towards the slightly open door, but his half-vision disorientated him and he crashed into a table. The noise attracted the attention of the old man who had been outside tending to his crops with his Meganium. At first, Coltrane was simply terrified of the kindly old gentleman, running away from him and often bumping into furniture whenever he came near to him. But eventually, as the human - Joesph - started to gently tend to his wounds and constantly reassured him that all was well, Coltrane began to feel more comfortable around him. He felt safer with Joesph and his gentle old Meganium - Rosa - than he ever had with his parents, and decided to stay there. The years past, and Coltrane recovered from his injuries - although his right eyesight was never to return - and grew up into a strong young Pokemon. By the time he had evolved into Ivysaur, he was helping Joesph and Rosa to look after and collect the crops everyday. His lifestyle was simple, but it was good. Although he feared the comeback of the gang of Weavile everyday, he knew that he would be under the best protection possible - although Rosa was old and slow, he had learned that she and Joesph used to be quite the combo back in their fighting days. But one year, there was an awful drought that lasted for several months and the crops started to suffer. Being in no possession of any Water-type Pokemon to help, the three of them became very hungry. Rosa fell ill and did not have the energy to use her reviving breath to cure the dead crops. They decided to try and move away, but halfway on their journey to Cerulean City, Rosa collapsed, greatly weakened by hunger and her disease. Her master held her in his arms as she peacefully passed away. Joseph had lost his lifelong partner and was simply inconsolable. They buried the Grass-type but the old man could not bring himself to leave her grave. He told Coltrane to go on ahead to the city and that he would soon catch up. Coltrane was reluctant to leave, but trusted his carer and went on ahead. Coltrane replenished his energy with berries and by basking in the intense sunlight. He refused to go as far as the city without his master and, with a berry branch in his possession, eventually went back to where he had left them only to find that Joseph was nowhere to be found. A bunch of hand-picked flowers and Joseph's old hat lay on Rosa's grave. Convinced that he was never going to see his master again, Coltrane spent the next few years of his life in total seclusion, wandering the region endlessly for any trace of his master. Finding none, the Ivysaur decided that he was furious at Joseph for abandoning him when they needed each other most and decided to give up his search, eventually finding a home within Virdian Forest. 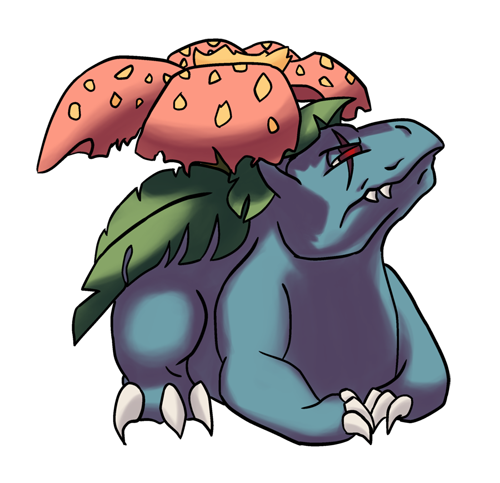 There he lived for many years, battling the wild Pokemon and any Trainers who passed through until he evolved into Venusaur. Even after that he continued to train himself, convinced that if he became strong he could survive and get over what he had been through. He would show Joseph that he didn't need him. When the epidemic struck, Coltrane was initially terrified of the hordes of undead that invaded his home, killing human and Pokemon alike. He was one of the last survivors, and fought alongside the others to defend his home but they were all overwhelmed. They fled the battle and went their separate ways. Coltrane wandered into the ??? region, and is currently simply continuing his life as a wanderer while trying to figure out what to do next. "I wouldn't mind a bit of company, to be perfectly honest." Appearance Coltrane's most noticeable feature is the vertical scar across his right eye, in which he is blind. He is quite bulky, even for his kind, and mostly moves slowly unless there's a reason to run. The flower on his back is in full bloom and has a pleasant scent, since he spends a lot of time in the sunlight, although a few of the petals have become a little worn at the tips. Personality After having spent a lot of his life in solitude, Coltrane is perfectly comfortable with being by himself. On the other hand, he equally enjoys the company of others and likes to make friends. He makes sure that everyone in the group is treated fairly and with respect ... as long as they return the kindness. He will not tolerate troublemakers and will often try to drive them away unless they clean up their acts. On rare occasions, he's been known to attack them in temper. Coltrane often talks or mutters to himself, even when around others, and is oblivious to what they think of this. Other than his short fuse for troublemakers, he is relatively calm and thinks the situation through before acting. He is very honest, sometimes brutally, and not afraid to express his opinions. He looks out for the younger ones and is not afraid to stand up for them and protect them. He is also rather stubborn and very independent, and will not take orders from anybody.